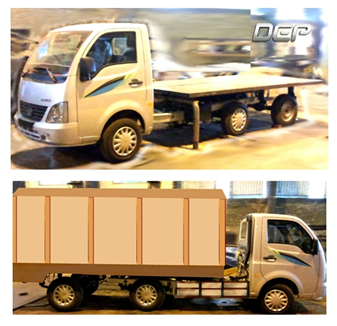 The Micro trailer is a product conceptualized and developed by the Global Product Development team at DEP. The goal of this product was mainly to increase the overall load carrying capacity of an existing prime mover, and with DEPs innovation the increase in load carrying capacity can be from 1tonne upto 2.5 tonnes. The key differentiator of the Micro trailer is the fact that unlike most trailers, where the cabin and load carrying zone are one unit, in the Micro trailer, the units are detachable. The Micro trailer is purely a base platform, which can be highly customized for any specific application. It can be used in a variety of applications- from mobile office, mobile dispensary, outdoor display unit, mobile lavatories, vegetable shops or exhibition stalls. It can prove of great use especially in remote areas. It can be combined with a detachable unit like a trailer, and if needed, a single cabin unit can be used to ferry multiple trailer units to and fro. This feature can result in significant cost savings if the use requires multiple units like for an exhibition. It comes in multiple size options, and in addition can be customized as per a customer’s requirement as well, taking into account the overall length and load specifications, and meeting all regulatory obligations. Through a 50-50 joint venture, ARK Industries in India is the licensed manufacturer and distributor of the Micro trailer.